That evening at around 8.30, doctors performed cranial surgery on Li Jianli, which finished around 11.30, and he was sent to intensive care. Three days later, once his life was no longer in danger, he was transferred to a normal ward. Li Jianli suffered this misfortune because he was driving a Japanese-brand car. The preceding few days, Li Jianli and his wife were helping their eldest son, Li Bing, decorate his marital home. Li Bing is 26, and plans to marry next year. He is trying to get the place ready before winter. The pair have another son who is 24, and also has a girlfriend. On the morning of September 15, Li Jianli drive his wife, eldest son and soon-to-be daughter-in-law to a homewares market in the city’s northern suburbs to choose decoration materials. As they were coming back that afternoon, on the northern stretch of Huancheng West Road, they encountered a crowd of anti-Japan protesters. Based on previous anti-Japanese actions in Xi’an, they thought the area outside the city wall would be safe. Such events normally took place in the city centre, and even there smashing of Japanese cars had only been only a sporadic occurrence. But this time was different. As they headed south they got caught up in a dense crowds. They wanted to turn around or duck into a side street, but that was already impossible. It was Li Jianli’s wife, Mrs Wang, who noticed the dozen or more people up ahead smashing cars. And before long this crowd was headed towards them in a state of excitement, carrying clubs, bricks and metal locks. Then they set to work on the Corolla. As she begged for mercy, something happened on the other side of the car. 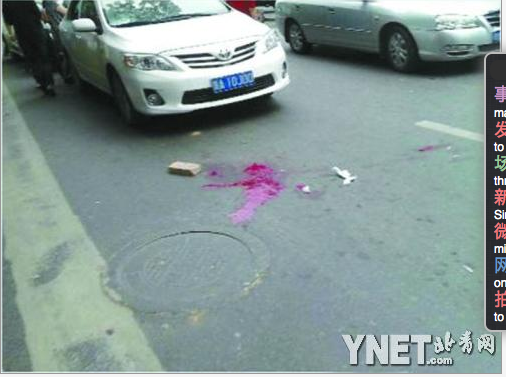 Mrs Wang looked over and saw her husband on the ground in front of the car, blood pouring from his head. She ran to him and took his head in her hands with no idea what to do. In a second her head went blank, and she started to wail. “A 20-something traffic officer ran over sat in the passenger seat and said: ‘Turn on the hazard lights, I’ll help clear a path,” at the same time contacting other police to clear the road ahead. This turn of events had far exceeded the expectations of the dense crowds of demonstrators and onlookers standing on both sides of the road. Ten or twenty car-smashers continued on their way, looking for the next target, while some bystanders took pictures. Someone suggested calling an ambulance, and one kind individual brought a roll of tissue paper over. Mrs Wang took it and pressed it to her husband’s head, but the blood and fluid kept flowing, staining a huge span of the road. A young man in a red shirt ran over and told Mrs Wang it was no use calling an ambulance as it wouldn’t be able to reach the area. She should instead hurry across and get a taxi to take the injured man to hospital or else he might die. Li Jianli was laid on the back seat with Mrs Wang covering his head wound as the taxi sped off. But they only got 500m down the road before it was again blocked with people. The taxi driver leaned out the window and shouted to a nearby police officer for help. A 20-something traffic policeman ran over and sat in the passenger seat. ‘Turn on the hazard lights, I’ll help clear the way,” he said, before contacting his colleagues to tell them to do the same. The help she received from kind-hearted people that day moved her, and offers some consolation. But the behaviour of the attacker and other car-smashers has left her confused. “Why did they take to their own people?” Mrs Wang has been thinking about this for days but still can’t fathom it. Han Pangguang’s attitude was, if a demonstration will cause smashing, then I’m willing to give it up. Han Pangguang is 31 years old, a native of Handan in Hebei Province. He rents a space in a Xi’an machinery market, selling tools. On September 15 his sister called to say the Public Security Bureau was trying to get in touch with him. When he went to the PSB, Han met not only relevant police staff, but also the manager of the machinery market and even the person in charge of the street they were on. The reason for the meeting was simple: on the day Japan announced its plan to nationalise the Diaoyu Islands, Han had collected several hundred signatures of sellers in the market, and applied to hold a protest rally on September 18. The relevant persons from the PSB now wanted him to abandon this application because, the way the protests were going that day, it looked like people of all kinds were using the opportunity to cause havoc, something no-one wanted to see. It was already 3pm when Han Pangguang emerged from the PSB. There were lots of demonstrators and onlookers on the street, and Han soon found that the situation had turned chaotic. Many people seemed to be venting and destroying rather than protesting. Japanese cars were constantly being smashed, and some participants seemed to be ‘combining experience’, sticking together and concentrating their collective efforts on single cars. The group of rioters continued on their way. Han wanted to follow them but then he noticed a lot of people congregating further down the road so he raced back and urged the mother and daughter: “Don’t go on, just barrel over the collapsed barrier and head back the other way.” But the lady wasn’t a great driver and she was nervous. She tried several times but couldn’t get across, so Han Pangguang had to get in and pump the accelerator himself to get the car across the flattened fence. Then he got out and chased after the marauding mob. Now by himself, Han Pangguang caught up to the group of car smashers, but he couldn’t be sure who the culprit was. He could only take a video and hope that they would be in it. Han Pangguang remembered that he had the number of a police sergeant during his protest application process. When he called the number he learned that the sergeant was already on duty at the centre of the protest — the Bell Tower. But the signal was terrible, perhaps because too many people in the area were trying to make calls, and after hanging up he couldn’t get through again. People in the crowd were yelling, “call the police,” and someone said “call an ambulance,” Han recalls. “I figured there was no time to waste, so I helped his family take him across the road, and there just happened to be an empty taxi there. I might have been a bit fierce; I screamed, “Will you take him or not?” The driver thought for a second, then nodded, and I put the injured guy in the back seat and told his wife to hurry. But the pair decided to give up the search, hailed a taxi, and headed for the hospital. Now by himself, Han Pangguang caught up to the group of car smashers but he couldn’t be sure who the culprit was. He could only take a video and hope that they would be in it. Photos of Li Jianli’s attacker, as posted by Han Pangguang on his Weibo account. The spot where Li Jianli was attacked is about 530m south of the Yuxiang Gate, next to a business hotel called “Shunhe”. There are businesses like the China Construction Bank, Bank of Xi’an, Tangjiu convenience store and Yuyuan Tea Shop nearby. But at the time of the incident most of the staff at these places were anxiously guarding the properties, so very few were watching proceedings. As Miss Liao of the tea shop recalls, both sides of the road were jammed with people. Although a tea shop is not a likely target, in that kind of atmosphere rationality is hard to maintain, and she was very nervous. A witness from one of these shops says it is highly likely that someone recorded what happened, because “there were more than 100 people taking photos around that Corolla”. The search for the assailant has unfolded through the joint efforts of the police and ordinary people. The day after the incident, Han Pangguang, the victim’s son and his fiancée went to to the Lianhu branch of the Xi’an PSB, where the police played Han’s footage in slow motion. The family recognised the culprit: he was round-faced, tall and well-built, and shirtless in the video, carrying a bloodstained white T-shirt. But the suspect only appeared for a short time in the footage, and from side-on. So in order to collect clues, Han Pangguang reopened his long-dormant Weibo account, “HCG5211“, and posted the side-on shot. Several internet users have provided the police with photos, from which it appears the suspect had cut his forehead in the process of smashing cars, and removed his shirt to wipe away the blood. The victim’s family has also used Weibo to appeal for clues. Much private and public property was destroyed across Xi’an city in the smashing and burning of September 15. The following day local police announced a ban on collective demonstration activities in areas such as Bell Tower Square and Xincheng Square. 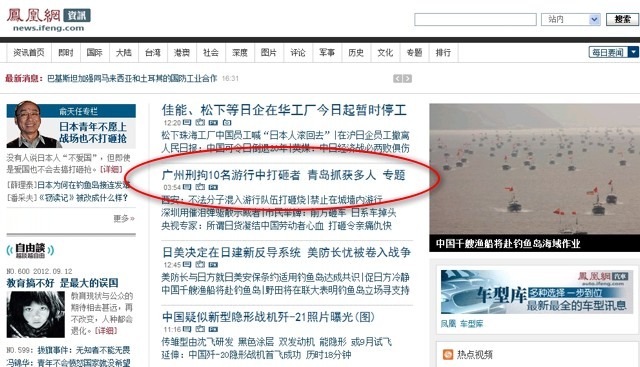 The same day, the Xi’an PSB posted five weibos regarding the events, expressing understanding and protection for the patriotic enthusiasm of citizens and students, but vowing to resolutely and in accordance with the law punish criminal elements who conduct smashing and burning. Meanwhile, the Xi’an PSB also announced two hotlines and an email address for complaints, following this up with four weibos urging citizens to “be rationally patriotic and reject violence”, and reminding them that “patriotism” is not a shield for violations of private property. The severe injuries to her husband were a huge blow to Mrs Wang, and for a time she was simply in shock. After two days when she finally came around, she simply couldn’t accept that such a terrifying thing could happen to her family. Mrs Wang’s family bought their Toyota Corolla in April last year after scrimping and saving and waiting until it was put on sale. The price was more than RMB 100,000, and including tax and insurance they spent RMB 120,000. She and her husband were both staff at the Lianhu District electrical appliance factory until it went bankrupt a few years ago, and their files were transferred to a labour agency. Mrs Wang has already organised her retirement, with a monthly pension of RMB 1,500. Her husband Li Jianli has not reached retirement age, and works with his son at a second-hand car dealership. Their other son works in a similar establishment. Buying a car was a big deal for this family, requiring many years of accumulation and endless comparisons of models and quality-to-price ratios. Her husband Li Jianli treasured the car, to the point where he tried to protect it [from the rioters]. Elder son Li Bing was on the same side of the car when the incident happened; he saw his father trying to get a rioter to change his mind by saying, “I’m Chinese too, I also want to protect the Diaoyus and be patriotic . . .” But this sentence was heartlessly cut off with two heavy blows. 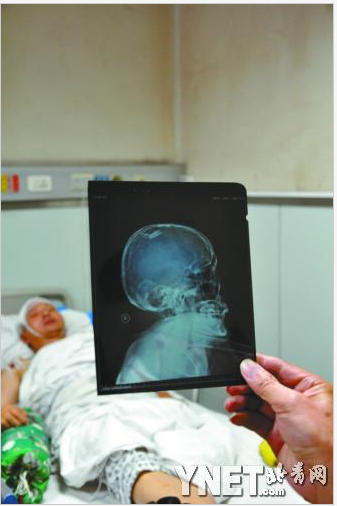 A U-shaped steel lock normally used to secure motorbikes became a murderous weapon, smashing a V-shaped dent in Li Jianli’s skull. X-ray images show the many bits of skull that the surgeon had to extract from the wound. Li Bing has the assailant’s appearance seared into his memory: strong and powerful, short hair, wearing a white T-shirt with a black “D” printed on it, and jeans. 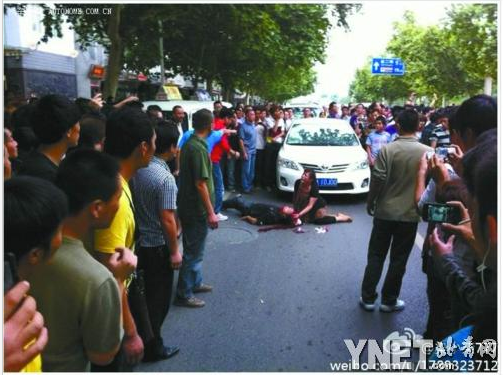 With Li Jianli lying on the ground in front of the car, there was no-one standing in the way of the mob, who continued to do as they wished. But Li Jianli’s severe injury may have put some kind of fear into them, and the Corolla actually got off lightly compared to many other destroyed and overturned cars — so lightly, in fact, that many netizens responded to the photographs online by suggesting that this was actually just the scene of a car accident. However, the serious skull injury has brought more serious problems upon this family, as no-one knows when or if Li Jianli will recover. If he is unable to regain basic usage of his right side, their future will be extremely difficult. But Mrs Wang doesn’t even dare to think about the future — the problems in front of her nose are enough to bring her to the point of despair. On the day of the attack Li Jianli’s medical bills, including surgery, totalled RMB 18,000, and since then every day has cost around RMB 4,000, so in just six days they have had to pay close to RMB 40,000. Mrs Wang says that the health insurance company told her that injuries sustained in a fight are not covered, so she has had to borrow money from relatives. “The RMB 18,000 on the first day, my nephew put that on his credit card, but the costs are high every day and we don’t know how long he’s going to be in for. I don’t even dare to think about it. During this anti-Japanese demonstration he went from being a protest applicant to a saviour; witnessing this incident was disheartening, saddening, taxing, and showed him the horrors of irrational venting. Han Pangguang says he couldn’t sleep that night. The sequence of events was playing over and over in his head like a movie trailer. The group moved on, and Han Pangguang helped get the car across the flattened barrier to the other side where they could drive to safety. Only afterwards did he see the old man on the ground in a pool of blood. 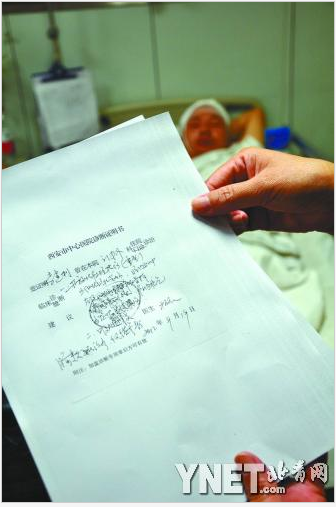 Han Pangguang believes that his actions led to the assailant attacking Li Jianli’s family. If he had arrived a few seconds later the Nissan would have been smashed, but Li Jianli would have avoided injury. “Move on, move on!” These words are now like a nightmare to Han Pangguang. Han Pangguang is a mediator by temperament, full of a sense of justice. He is willing to be strong in his actions and is normally friendly and kind. Han and several friends made matching red shirts and called themselves the “volunteer family”, helping kids in poor areas, handicapped people and disadvantaged groups. In emergency situations he loves to take the lead and aid those in need. However, he admits he can be too direct, inclined to be anxious and cause insult to people. Having lived through this incident, Han Pangguang is like many others who now deeply treasure rationality, kindness, and justice. To step forward and try to persuade and save people in a situation where most people were just watching on while a minority smash things up, is something that requires a great deal of heart. It was not just the owners of Japanese cars — no-one had any sense of security [that day]. A Chinese-brand “Longines” watch shop was deemed by the mob to be connected with Japanese ronin due to its name, and was promptly destroyed. The hardy watches were looted. Some people even witnessed a university student being cursed as a “traitor” and stripped to his underwear for wearing a Japanese-brand jacket. Having lived through this incident, Han Pangguang is like many others who now deeply treasure rationality, kindness, and justice. To step forward and try to persuade and save people in a situation where most people are watching on while a minority smash things up, this is something that requires a great deal of heart. On his mission to save people, Han has felt weak and powerless; before he helped carry Li Jianli across the road, he cried out for help from the crowd, but none was forthcoming. Had there been a “Li Zhao” nearby on Huancheng West Rd when Han Pangguang convinced the mob to “move on”, Li Jianli might have escaped his terrible misfortune. such a horrible thing to happen to the driver and his family 😦 good on that taxi driver.